Marr Consulting International is pleased to provide for free download the Green Your Business: Toolkit for Tourism Operators - a collaboration between the Tourism Industry Association of Canada, the Canadian Tourism Commission, Parks Canada, and the author and creator Marr Consulting Services. 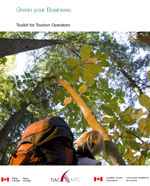 The toolkit aims to provide practical tips and sound guidance to the Canadian tourism industry. We've placed a special focus on small- and medium-size enterprises (SMEs). Think of this document as a kind of "best practices" handbook, stocked with user-friendly, accessible and practical tips. A growing body of evidence suggests that integrating sustainable practices into your business - whether in the areas of heating, lighting, water usage, landscaping or printing - will ultimately reduce your operating costs. A green strategy will also attract the emerging but fast-growing market of discerning travellers seeking authentically sustainable experiences and services. We've designed this resource for multiple tourism-sector audiences. Owners and managers will find material addressing the policy, budgetary and strategic aspects of their operations. Staff "champions" will find resources for individual employees keen to lead the green charge at their workplace. The toolkit will also appeal to tourism associations and destination marketing organizations that wish to disseminate some of these ideas amongst members.